Δισκογραφική επιστροφή μετά από εννέα χρόνια για τους Lion's Share. Τον περασμένο Νοέμβριο κυκλοφόρησαν το ep με τον τίτλο "EP", ενώ προ ημερών "έβγαλαν" το single "Chain Child". Οι Lion's Share μας έρχονται από την Σουηδία. Δελτίο τύπου: «Lion's Share is a Swedish heavy metal band that has so far released six albums and one EP worldwide. The band have toured Europe with bands like Motörhead, Manowar, DIO, Saxon, Iced Earth, Nevermore, U.D.O., Dee Snider and have played many of the major festivals. 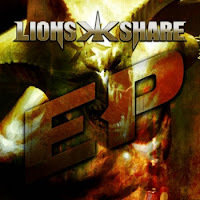 The Lion's Share album catalogue features appearances by members and ex-members of KISS, Megadeth, King Diamond, HammerFall, Opeth, Symphony X, Chimaira, Therion, Yngwie Malmsteen, Candlemass. The albums were mixed by top engineers such as Jens Bogren (Arch Enemy, Opeth, Symphony X, Sepultura, Kreator, Amon Amarth). Niklas Flyckt (Grammy award winner 1 time and nominated 4 times), Ronny Lahti (Roxette, Europe, Glenn Hughes, Electric Boys), Robert Wellerfors (The Rolling Stones, Joey Tempest, Eagle-Eye Cherry, Ace Of Base). Lyric video: "Sins Of A Father"